Background: Mutations in the early growth response 2 (EGR2) gene have recently been found in patients with congenital hypomyelinating neuropathy and Charcot-Marie-Tooth type 1 (CMT1) disease. Objective: To determine the frequency of EGR2 mutations in patients with a diagnosis of CMT1, Dejerine–Sottas syndrome (DSS), or unspecified peripheral neuropathies. Methods: Fifty patients and 70 normal control subjects were screened. Results: A de novo missense mutation (Arg359Trp) in the α-helix of the first zinc-finger domain of the EGR2 transcription factor was identified in a patient diagnosed with a clinical phenotype consistent with DSS. This patient had a motor median nerve conduction velocity of 8 m/s. A sural nerve biopsy showed a severe loss of myelinated and unmyelinated fibers, evidence for demyelination, numerous classic onion bulbs, and focally folded myelin sheaths. DSS is a severe, childhood-onset demyelinating peripheral neuropathy initially thought to be inherited as an autosomal recessive trait. However, several dominant heterozygous mutations in the peripheral myelin protein 22 (PMP22) gene and dominant mutations in the peripheral myelin protein zero (MPZ) gene, both in the heterozygous and homozygous state, have been reported in patients with DSS. Conclusions: Hereditary peripheral neuropathies represent a spectrum of disorders due to underlying defects in myelin structure or formation. Here we report a novel missense mutation (Arg359Trp) in the EGR2 gene in a patient diagnosed with DSS. Furthermore, we identified a silent polymorphism in the EGR2 transcription factor at codon Arg362. Patients with a peripheral neuropathy, referred to our laboratory for DNA diagnosis or research purposes, were initially screened for the presence of the CMT1A duplication in chromosome 17p11.2 or mutations in the peripheral myelin protein genes PMP22, MPZ, and Cx32. For this study, we selected 50 “unrelated” patients in whom the absence of the CMT1A duplication was confirmed by Southern blot hybridization or short tandem repeat analysis of polymorphic markers localized in the CMT1A duplication region, according to methods previously described.9 Furthermore, single-strand conformation polymorphism (SSCP) analysis was used to exclude mutations in PMP22, MPZ, and Cx32.10 The 50 patients included 4 with DSS and 14 with CMT1. The remaining 32 patients had a peripheral neuropathy, but not enough clinical data were available to specify the subtype. In Patients PN-27.1 and PN-329.1, direct sequencing of EGR2 was performed with primer 2.5cF (see table) using the dRhodamine Dye Terminator Cycle Sequencing kit (Perkin-Elmer, Applied Biosystems, ABI, Foster City, CA). The PCR products were loaded on a 6% polyacrylamide sequencing gel and separated on the ABI Automated DNA Sequencer 377. The data were collected and analyzed using the ABI DNA Sequencing Analysis Software, version 2.1.2. The EGR2 mutation at codon 359 creates an NlaIII restriction site that can be detected by restriction analysis of the PCR product (figure 1). For this purpose, EGR2 exon 2 was PCR amplified with primers 2.5cF and 2.5cR (see table) using a Taq DNA polymerase PCR kit (Gibco BRL–Life Technologies, Merelbeke, Belgium). Fifteen microliters of the PCR amplification product was digested with 10 U of NlaIII restriction enzyme (New England Biolabs; Beverly, MA). The restriction digest was analyzed on a 4% agarose gel. Figure 1. NlaIII restriction pattern of the EGR2 Arg359Trp mutation in family PN-27. 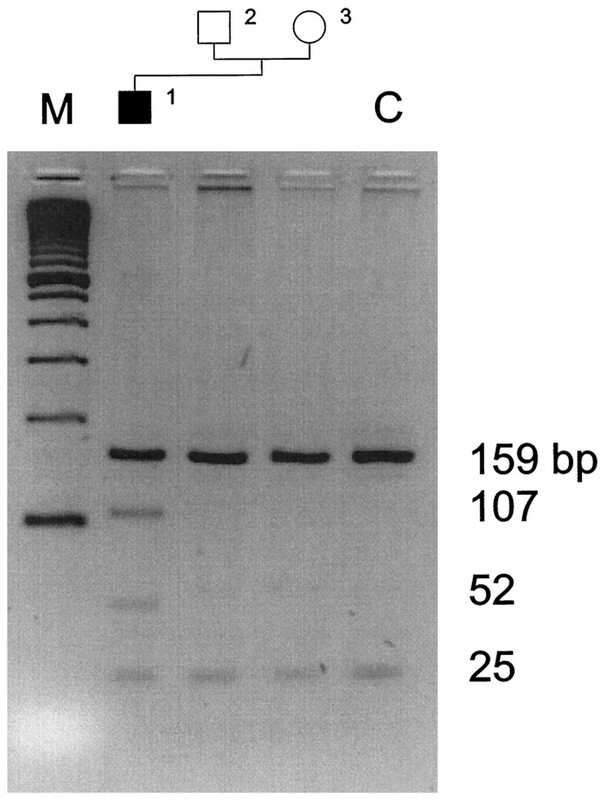 In the normal control (C), PN-27.2 (father) and PN-27.3 (mother), two PCR fragments are obtained of 159 and 25 bp. In the patient with de novo Dejerine–Sottas syndrome, PN-27.1, the 107- and 52-bp fragments result from an additional NlaIII restriction site due to the Arg359Trp mutation. The size marker (M) represents a 100-bp ladder (Gibco BRL–Life Technologies). The total length of the EGR2 PCR product amplified with primers 2.5cF and 2.5cR is 184 bp (see table). Motor and sensory nerve conduction velocity (NCV) measurements were performed according to standard procedures. A sural nerve biopsy was performed in Patient PN-27.1 at the age of 6 years (figure 2). The nerve was fixed in 4.5% phosphate-buffered glutaraldehyde, postfixed in 2% phosphate-buffered osmium tetroxide, and embedded in araldite. Semithin sections were stained with toluidine blue. Quantitative studies on transverse semithin sections of the nerve were done using a Sony (Tokyo, Japan) camera projecting the picture on the 21-inch screen of a Macintosh computer (Apple, Cupertino, CA). A computing program, Image 1.31, from the NIH (Bethesda, MD) was used to determine the density of the myelinated fibers per square millimeter. Ultrathin sections were stained with uranyl acetate and lead citrate and were examined with a Philips CM10 electron microscope (Eindhoven, the Netherlands) at 60 kV. Figure 2. Sural nerve biopsy sample of Patient PN-27.1. (A) Electron micrograph showing numerous classic onion bulbs. A demyelinated axon (arrow), a hypomyelinated axon (double arrows), normal myelinated axons, and a myelin outfolding (arrowheads) are seen. Scale bar = 10 μm. (B) Myelin infolding and outfolding in the Schwann cell not surrounding the entire axon. Standard electron microscopic techniques—fixation in glutaraldehyde, postfixation in osmium tetroxide, embedding in araldite, staining with uranyl acetate and lead citrate—were used. Scale bar = 1 μm. The DNA samples of 50 unrelated patients with CMT1, DSS, or unspecified peripheral neuropathy were examined by SSCP for the presence of mutations in the EGR2 gene. The CMT1A duplication in chromosome 17p11.2 and mutations in the peripheral myelin protein genes PMP22, MPZ, and Cx32 had previously been excluded (data not shown). An altered SSCP pattern of exon 2 was found for EGR2 in two patients, PN-27.1 and PN-329.1, and direct DNA sequencing of exon 2 was subsequently performed. A silent mutation in codon Arg362 at the third base (CGA→CGC) was detected in Patient PN-329.1, who has a demyelinating polyneuropathy but no positive family history (figure 3). The same mutation was present in 1 of 70 normal control samples, indicating that this silent mutation is a rare polymorphism (2 of 240 chromosomes, or 0.8%) likely unrelated to pathogenesis. Figure 3. First zinc-finger domain of EGR2. (Top) Structure of zinc-finger 1 with arrows showing the location of the Arg359Trp missense mutation and the Arg362Arg polymorphism (*). (Bottom) The wild-type amino acid and DNA sequence of the α-helix of zinc finger 1 compared with the mutated sequence in Patient PN-27.1 with DSS (1). The silent mutation at codon 362 is also indicated (2). The numbering of the EGR2 codons is based on the amino acid sequence of Joseph et al.4 using the first methionine as start codon (National Center for Biotechnology Information accession number 105902). In Patient PN-27.1, a heterozygous missense mutation (CGG→TGG) leads to an amino acid change Arg to Trp at codon 359 (data not shown). The mutation is located in the α-helix of the first zinc-finger domain of the EGR2 gene (see figure 3) and creates an NlaIII restriction site (see figure 1). The Arg359Trp mutation was not present in the healthy parents of Patient PN-27.1, indicating that this is a de novo EGR2 mutation (see figure 1). The EGR2 mutation was absent in 70 normal control samples. The proband (PN-27.1) had no family history of any neuromuscular disorder and his parents were not consanguineous. His three brothers and a sister were healthy on clinical diagnosis. The patient’s birth was normal, but he had some breathing and feeding difficulties in the first weeks of postnatal life. His head tended to fall to one side and he never crawled. Other motor milestones were delayed and he could not walk without support until the age of 3 years. At the age of 4 years, he had difficulties standing and walking, tended to fall often, and needed help to rise from a sitting position. His intellectual milestones were normal and he started to speak at 1 year of age. Clinical examination at 6 years of age revealed that he tended to walk with a broad base. He was unable to get up from a supine position. The neck muscles were moderately weak and there was mild facial weakness. The limb muscles were very weak and atrophic. The tendon reflexes were absent and the plantar reflexes were flexor. Sensation, as far as it could be tested, was normal. The motor NCVs of the median and fibular nerve were 8 m/s and the amplitudes of the evoked motor responses were severely reduced. The sensory nerve action potentials could not be elicited. The patient’s father (PN-27.2) and mother (PN-27.3) had normal motor median NCVs of 59 and 55 m/s, respectively. Patient PN-27.1 died at the age of 16 years from respiratory failure associated with a pulmonary infection. Patient PN-27.1 had a sural nerve biopsy at the age of 6 years. Semithin sections showed marked loss of myelinated and unmyelinated fibers and numerous onion bulbs with nonmyelinated, small, thinly myelinated, or normal axons in their centers. Some irregularly folded myelin sheaths were observed. Some myelin debris was present and there were no inflammatory cell infiltrates. Loss of myelinated fibers was noted, with 3,226 myelinated fibers/mm2 (normal age-matched value for the sural nerve in our laboratory is 13,866/mm2). Large myelinated fibers were totally absent on axonal diameter histograms. Medium-sized myelinated fibers were markedly reduced and small myelinated fibers were even less numerous. A large dispersion in the g-ratio (axonal diameter/total fiber diameter) was observed, ranging from 1 (demyelinated axons), to 0.75 (mean g-ratio of hypomyelinated axons), to 0.48 (mean g-ratio of normal myelinated axons), and to values below 0.20 (mean g-ratio at the level of a focally folded myelin sheath). Electron microscopy revealed that nearly all fibers were enclosed in small or large classic onion bulbs (see figure 2A). The onion bulbs were composed of concentrically arranged, flattened Schwann cell processes with or without unmyelinated axons, rare fibroblasts, and normal collagen deposition. Each onion bulb contained either a demyelinated axon with increased density of neurofilaments and neurotubules, a remyelinated axon, or, less frequently, a normal myelinated axon. Focally folded myelin sheaths were found with redundant myelin loops and excessive myelin infolding and outfolding, not wrapping around the entire axon (see figure 2B). On longitudinal sections, focal myelin infoldings and outfoldings were adjacent to normal myelin portions of mostly thin myelin sheaths. Occasional axonal compression was seen. Normal myelin packing and periodicity were observed. There was also demyelination, with myelin debris in Schwann cells and macrophages. No axonal regeneration clusters were found. Unmyelinated fibers were markedly reduced and were involved in onion bulbs. Empty Schwann cell units and collagen pockets were rare. Warner et al.3 recently reported one recessive EGR2 mutation (Ile268Asn) in a family with consanguineous parents and three affected children diagnosed with CH neuropathy. This mutation occurred in the putative inhibitory domain of the EGR2 gene. In addition, dominant EGR2 mutations (a double mutation Ser382Arg-Asp383Tyr and a single mutation Arg409Trp) were identified in the second and third zinc-finger domains, respectively. The double missense mutation occurred in a patient with de novo CH. The single missense mutation was segregated in a CMT1 family. We examined 50 patients with CMT1, DSS, or unspecified peripheral neuropathy and 70 healthy control subjects, and found a rare silent mutation in EGR2 residue Arg362 in 2 of 240 chromosomes (0.8%). Furthermore, we identified a novel missense mutation (Arg359Trp) in the α-helix of the first zinc-finger domain of EGR2. The Arg359Trp mutation was present in Patient PN-27.1, who had an early age of onset, very severe peripheral neuropathy, and markedly reduced motor NCVs. His asymptomatic parents did not have the Arg359Trp EGR2 mutation, indicating that PN-27.1 is a de novo case. The sural nerve biopsy of Patient PN-27.1 showed markedly decreased nerve fiber density. Numerous classic onion bulbs surrounding demyelinated axons, thinly remyelinated axons, or, less frequently, normal myelinated axons were observed. Focal myelin thickening due to redundant myelin loops and excessive myelin infolding and outfolding without wrapping around the entire axon were also found. The myelin foldings were smaller and more irregular than tomacula. No basal lamina onion bulbs were seen. Based on the clinical, neurophysiologic, and pathologic findings, Patient PN-27.1 was diagnosed with DSS. To date, no EGR2 mutations have been associated with DSS. Dejerine–Sottas syndrome, or hereditary motor and sensory neuropathy type III, was first described by Dejerine and Sottas in 1893.12 This entity has provoked much controversy because of the lack of consensus on diagnostic criteria. Originally, DSS was defined as a severe demyelinating peripheral neuropathy with autosomal recessive inheritance and infantile onset.12 Other diagnostic criteria, such as very low NCVs (<6 m/s) and an elevated protein concentration in the CSF, were added later.13 Clinical, pathologic, and molecular genetic studies have shown that DSS is a heterogeneous disease. Autosomal recessive DSS is extremely rare and requires the presence of at least two affected sibs and normal clinical and electrophysiologic findings in the parents. Several different autosomal dominant mutations associated with DSS were found in the PMP22 and MPZ genes, suggesting that these cases may represent CMT1 with a very severe clinical phenotype rather than DSS cases,1 or that these disorders represent a spectrum of clinical phenotypes resulting from a common underlying defect in myelination.14,15 Tyson et al.16 reported nine patients with DSS and identified dominant PMP22 and MPZ mutations in four and two patients, respectively. In the remaining three patients, presumably with autosomal recessive inheritance, no mutations were found in PMP22 and MPZ. Two of these patients had focally folded myelin sheaths on nerve biopsy. In our Patient PN-27.1, axons with focal myelin thickenings were surrounded by classic onion bulbs. It is well known that zinc fingers are protein structural motifs serving as DNA binding domains in several transcriptional regulatory proteins. The EGR2 gene belongs to the Cys2/His2 zinc-finger class with conserved motifs of 28 to 30 amino acids that are usually present as tandem repeats. Nardelli et al.17 modified the conserved region of finger 1 in Krox20, the mouse homologue for EGR2, replacing Glu and Arg at positions 18 and 21 by His and Thr, respectively. This mutated protein was matched against several target sequences to detect DNA binding. It was shown that the amino acids Glu (position 18) and Arg (position 21) in Krox20, corresponding to residues 356 and 359 in EGR2 (see figure 3), play an essential role in DNA binding recognition and specificity. Pavletich and Pabo18 presented the crystal structure of the zif268 (also known as EGR1, Krox24, or NGFI-A) zinc-finger domain when bound to the guanine-rich strand of a consensus DNA binding site. They determined the location of peptide DNA and intrapeptide atomic contacts and concluded that base recognition is largely a function of arginine–guanine contacts within and adjacent to the α-helix. For DNA binding, the arginines are able to form hydrogen bonds on the G-rich strand of the consensus binding site.18 This hydrogen bond most likely is not established when the Arg residue is mutated to a Trp, as in our Patient PN-27.1 with DSS, suggesting that the Arg359Trp mutation is a loss-of-function mutation. Furthermore, Wilson et al.19 performed a mutational analysis of the NGFI-A zinc fingers and demonstrated that mutant zinc fingers may be defective in DNA binding when expressed in yeast. If the wild-type Arg residue at position 330 in NGFI-A zinc finger 1, corresponding to position 359 in EGR2, is replaced by a Ser residue, DNA binding does not occur. Finally, the relative amino acid substitution frequency of Arg→Trp, at an evolutionary distance of 256 accepted point mutations per 100 residues (PAM), is very rare (PAM = 0.3).20 Preliminary functional analysis of the Arg359Trp mutation showed loss of DNA binding to the consensus target sequence as determined by electrophoretic mobility shift assays. However, transcriptional analysis showed that the Arg359Trp mutant was able to activate transcription of a luciferase reporter construct at a very low level, suggesting that it retains some partial DNA binding activity not detectable by the electrophoretic mobility shift binding assay.21 Each of these findings support the contention that the Arg359Trp mutation of the EGR2 zinc finger 1 in our patient with DSS has functional consequences and is not a benign variant. It is well known that CMT1, DSS, and CH can be associated with mutations in the MPZ gene. Also, mutations in the PMP22 gene can lead to distinct phenotypes such as CMT1, DSS, or hereditary neuropathy with liability to pressure palsies.1 It was recently shown that distinct mutations in the EGR2 transcription factor can also give rise to a CMT1 and CH phenotype.3 This report adds DSS to the list of phenotypes associated with EGR2 mutations. It is evident that mutations in the EGR2 transcription factor profoundly disturb the normal myelination process in the peripheral nervous system. The differences in clinical, electrophysiologic, and histopathologic severity of these peripheral neuropathies can be explained by the site and type of mutation and their influence on the protein function. It is unknown how frequent EGR2 mutations are in the total population of patients with inherited demyelinating polyneuropathies. The authors thank the patients and their relatives for their kind cooperation, Prof. Dr. J. Clauwaert (University of Antwerp, Belgium) for his critical review, Mrs. S. Debrabandere for technical assistance, and Mrs. I. Bats (Born-Bunge Foundation, Belgium) for the histopathologic micrographs. Funded by a special research project of the University of Antwerp (Belgium), the Fund for Scientific Research, Flanders (FWO; Belgium), and the Association Française contre les Myopathies (France). V.T. and E.N. are research assistants of the FWO. C.V.B. is the coordinator of the European CMT consortium sponsored by a European Union BIOMED2 grant (CT961614 and CT960055). De Jonghe P, Timmerman V, Nelis E, Martin J-J, Van Broeckhoven C. Charcot-Marie-Tooth disease and related peripheral neuropathies. J Peripheral Nerv Syst 1997;2:370–387. Nelis E, Haites N, Van Broeckhoven C. Mutations in the peripheral myelin genes and associated genes in inherited peripheral neuropathies. Hum Mutat 1999;13:11–28. Warner LE, Mancias P, Butler IJ, et al. Mutations in the early growth response 2 (EGR2) gene are associated with hereditary myelinopathies. Nat Genet 1998;18:382–384. Rangnekar VM, Aplin A, Sukhatme VP. The serum and TPA responsive promotor and intron-exon structure of EGR2, a human early growth response gene encoding an zinc finger protein. 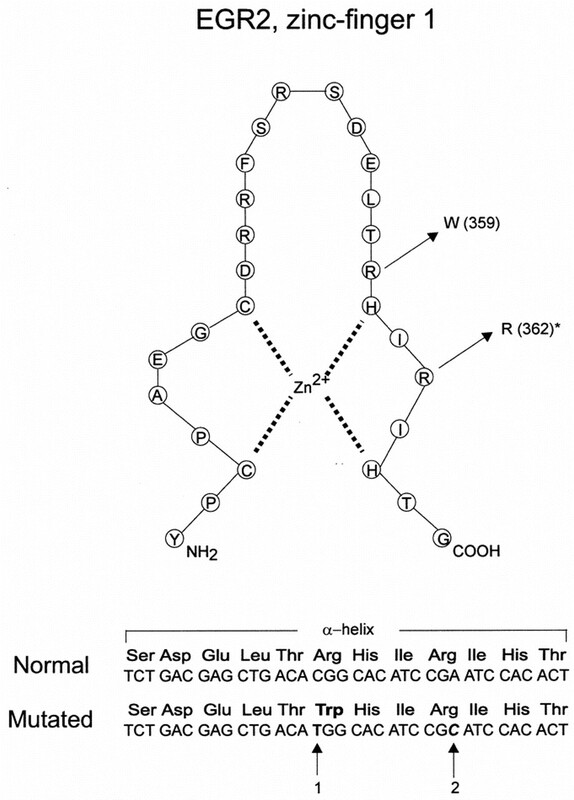 Nucleic Acids Res 1990;18:2749–2757. Sham MH, Vesque C, Nonchev S, et al. The zinc finger gene Krox20 regulates HoxB2 (Hox2.8) during hindbrain segmentation. Cell 1993;72:183–196. Topilko P, Schneider-Maunoury S, Levi G, et al. Krox-20 controls myelination in the peripheral nervous system. Nature 1994;371:796–799. Swiatek PJ, Gridley T. Perinatal lethality and defects in hindbrain development in mice homozygous for a targeted mutation of the zinc finger gene Krox-20. Genes Dev 1993;7:2071–2084. Navon R, Timmerman V, Löfgren A, et al. Prenatal diagnosis of Charcot-Marie-Tooth disease type 1A (CMT1A) using molecular genetic techniques. Prenat Diagn 1995;15:633–640. Nelis E, Warner LE, De Vriendt E, Chance PF, Lupski JR, Van Broeckhoven C. Comparison of single-strand conformation polymorphism and heteroduplex analysis for detection of mutations in Charcot-Marie-Tooth type 1 disease and related peripheral neuropathies. Eur J Hum Genet 1996;4:329–333. Nelis E, Simokovic S, Timmerman V, et al. Mutation analysis of the connexin32 (Cx32) gene in Charcot-Marie-Tooth neuropathy type 1 : identification of five new mutations. Hum Mutat 1997;9:47–52. Dejerine J, Sottas J. Sur la névrite interstitielle, hypertrophique et progressive de l’enfance. CR Soc Biol (Paris) 1893;45:63–96. Dyck PJ, Chance P, Lebo R, Carney JA. Hereditary motor and sensory neuropathies. In: Dyck PJ, Thomas PK, Griffin JW, Low PA, Poduslo JF, eds. Peripheral neuropathy. 3rd ed. Philadelphia:WB Saunders, 1993:1094–1136. Lupski JR. Molecular genetics of peripheral neuropathies. In: Martin JB, ed. Scientific American molecular neurology. New York:Scientific American, 1998:239–256. Warner LE, Garcia CA, Lupski JR. Hereditary peripheral neuropathies : clinical forms, genetics and molecular mechanisms. Annu Rev Med 1999;50:263–275. Tyson J, Ellis D, Fairbrother U, et al. Hereditary demyelinating neuropathy of infancy : a genetically complex syndrome. Brain 1997;120:47–63. Nardelli J, Gibson TJ, Vesque C, Charnay P. Base sequence discrimination by zinc-finger DNA-binding domains. Nature 1991;349:175–178. Pavletich NP, Pabo CO. Zinc finger-DNA recognition : crystal structure of a Zif268-DNA complex at 2.1 A. Science 1991;252:809–817. Wilson TE, Day ML, Pexton T, Padgett KA, Johnston M, Milbrandt J. In vivo mutational analysis of the NGFI-A zinc fingers. J Biol Chem 1992;267:3718–3724. Schulz GE, Schirmer RH. Empirical similarities between amino acid residues. In Principles of protein structure. Heidelberg:Springer-Verlag, 1984:166–205. Warner LE, Svaren J, Milbrandt J, Lupski JR. Functional consequences of mutations in the early growth response 2 (EGR2) gene correlate with severity of human myelinopathies. Hum Mol Genet 1999 (in press).